Movember, which has been taking place since 2004, is an annual event encouraging men to grow out their mustaches from 1 to 30 November to raise awareness of men's health issues, particularly prostate cancer. The corresponding Movember Foundation is a global charity that raises funds that deliver innovative, breakthrough research and support programs that allow men to live happier, healthier and longer lives. Wigs are encouraged for the ladies to show their support to all the cancer patients who lose their hair during cancer treatments. Hong Kong’s favourite mixologists will be behind the bar for the duration of the event, preparing their own personal creations using spirits from liquor sponsors Grey Goose and Bacardi. Guest bartenders for the event include Austen Lendrum of Mahalo Tiki Lounge, Tunny Alexander Grattidge of Chachawan, Liam Baer of Fish & Meat and award-winning mixologist Tom Wood. The four will battle it out to earn votes from partygoers for the best cocktail of the evening, so may the best bartender win! 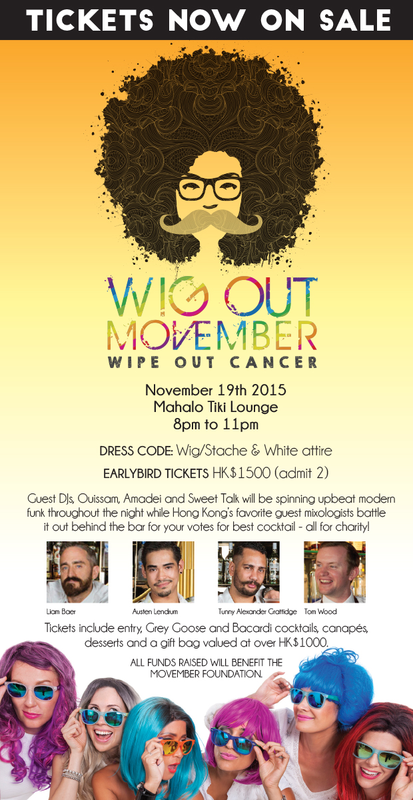 To coincide with the retro décor of Mahalo Tiki Lounge and the wild wigs donned by guests, some of Cliché Records’ most notorious DJs, Ouissam, Amadei and Sweet Talk, will be spinning upbeat modern funk for the duration of the event. Those who choose to stay for the after party can dance enjoy their beats until the wee hours of the night. In typical fashion, Hong Kong’s most-loved brands have come together to participate in the event by way of donation to an epic silent auction table or with items and gift cards in each guests’ gift bag. Participating brands to-date include Escapade Sports, Bo Concept, Airplay Blowdry Bar, Caudalie, Bibo, Reddie Designs, Fomo Eyewear, UniWigs and Moxie. 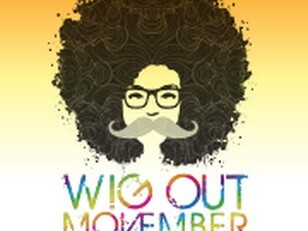 Come and join the wigout Movember team to grow a “MO” and make a difference!